Look through old pictures, letters, deeds, wills, military records, family data etc to find clues about your ancestors. Now, I already knew about this relative as I had met him and been told stories about him by my Mum, but it's nice to be able to see a photograph of him in his uniform. QH was the youngest of 7 siblings. 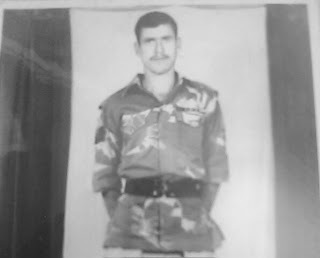 I was told he worked in the Pakistan Army and went to fight in the war between Pakistan and India, where he was captured and kept prisoner for some time until he was returned. So very true. I borrowed a photo album from my grandmother and found out a lot of additional information...just from the backs of photos!